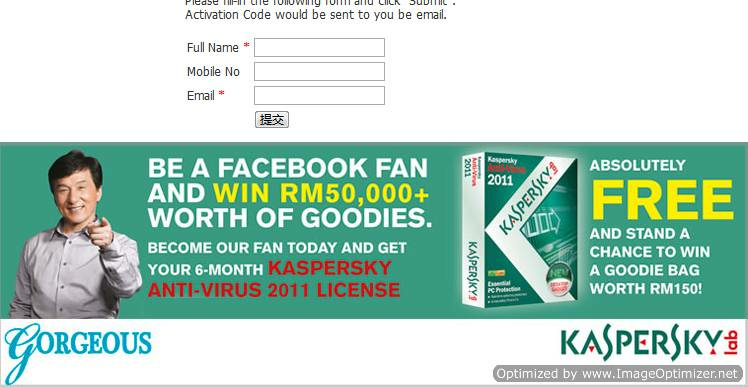 Thanks to a promo by Gorgeous Magazine from Malaysia, you can grab free Kaspersky Antivirus 2011 license key for 6 months. Thanks to tuanyt for the tip, we are sharing it here. The promo involves Liking a Facebook fan page of Gorgeous Magazine and then submitting the Name and email address to get the license key. As this offer of Free Kaspersky Antivirus 2011 license key is only for Malaysia,Â you need to use a Malaysian Proxy or Malysian IP. Now you can easily grab a FREE Kaspersky Antivirus 2010 license key which is vaild for 6 months. If you are a die hard fan of Kaspersky or you need a good Antivirus, grab this offer before it expires. How to use these proxies. No key coming despite their assurance. The promo is over. Wait till a new promo comes. I have installed kaspersky antivirus 2011 in my computer so,I need a registration key to install it completely in my computer.